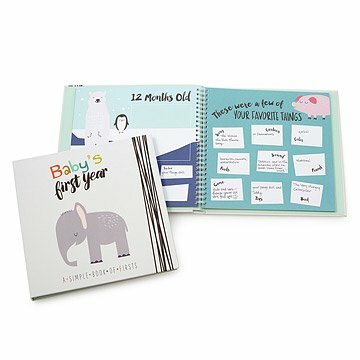 This beautiful baby book offers all the prompts and pages to create your own first-year scrapbook. Mom and maker Haily Meyers made her beautiful baby book as an easy alternative to more labor-intensive first-year scrapbooks. After realizing the time commitment needed to create a creative, custom baby book following the birth of her first child, she created this no-fuss baby journal that allows a new mom to capture her baby’s most darling moments almost effortlessly and beautifully. Each lovely spread is fully decorated with a unique animal motif and requires only a photo of the child and a few hand-written notes, musings, or memories from mom or both the child's parents. Handmade in Scottsdale. Arizona. 2 pre-baby pages for photos, an ultrasound, and a note to the baby-to-be. 3 pages for when baby arrives including a spot for footprints, a page to place their birth announcement, and your hospital bracelets. 2 your world pages for a photo of home and how much things cost when baby was born. 12 pages of month documenting. Graphic designer and mother Haily Meyers began her career designing greeting cards and shifted to art-centered baby products when her daughter was born. Monthly baby stickers were her first foray into the baby space, and three years later her product assortment has grown to include art prints, closet dividers, and baby memory books. She finds inspiration in nature and in the simple beauty of her daughter's smile. Her aesthetic is retro with a modern whimsy, focusing on color and typography. She lives in Scottsdale, Arizona with her husband, daughter, and two dogs, Birdie and Winifred. Intended for parental use only. Gifts that I would recommend for growing families! Loved the design and layout. Great art work. Fun categories. I gave this as a baby shower gift and the new Mom loved it. Sweet, simple and easy to use. I love that I don't have to think about what to put in the baby book and it's all spelled out. As a mom of a toddler and an infant and with multiple jobs, this book makes scrapbooking and simple and doesn't take a lot of time. :) I think it will be a great keepsake for my children when they get older. I bought this for my new baby, to fill out in the hospital while I wait! Perfect gift for a baby shower! I love this memory book! Super cute illustrations and layouts with lots of pages to fill out, including some empty ones at the end for whatever the mother feels like putting in. It is a perfect gift for any expecting mother as it will help her document not only just the baby's first year, but also has pages for up to baby's 5th year. It shows great attention to detail ( for example, there are pages about the baby's first home, gas prices/presidency at the time, baby's family tree, and spots for pictures of baby at each holiday). I gave it as a gift to my sister-in-law for her baby girl due in a month. I can't wait to purchase one for myself when I became a mother one day! Some first year memory books are so involved - it's hard to keep them updated. This one is simple, beautifully put together, and captures those moments most precious to new parents. It's lovely, it's beautiful every positive comment it's that and so much more. This is the perfect baby book! It goes month by month with a space for a picture and space for notes. There are also spaces for special events and before babies birty. It is simple but in the best way; a lot of baby books have too much to fill in and it is overwhelming (esp. when caring for a new baby!). The illustrations are adorable as well. I will be buying this as a gift in the future.